The Ernest N. Morial Convention Center is on the cusp of returning to a major expansion with a new hotel and exhibit hall on long-vacant land in the Lower Garden District, officials said Wednesday morning. A bill is pending before the state legislature this session that would allow the expansion to begin, making use of vacant land the convention center owns along Tchoupitoulas nearly all the way to the abandoned Market Street Power Plant, convention center president Melvin Rodrigue told the Bureau of Governmental Research. Officials are confident about the passage of the funding bill, Rodrigue said, and have already prepared a request for proposals to developers to build the project as a public-private partnership. Many of the details of the project will be worked out during that phase, and depending on the size of the new hotel, the total project could become as much as a $1 billion investment, he said. “We have two of the top developers in the world calling us on a weekly basis to check in and see what our status is,” Rodrigue said. 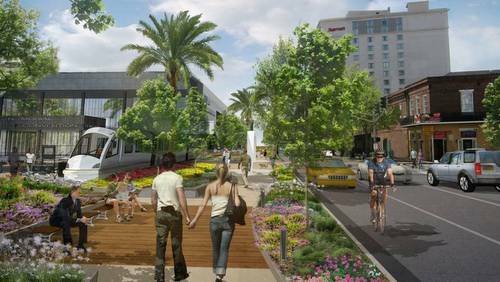 Meanwhile, the convention center has already begun traffic studies on another aspect of the project, converting part of Convention Center Boulevard into a linear park running the length of the convention center from Harrah’s Casino to Henderson Street while improving traffic flow onto the surrounding streets. Between the park and the convention center buildings would be room for a “people mover,” to help conference attendees navigate the nearly mile-long facility. “We think there’s a lot of opportunity to change the streetscape and beautify the buildings, but also make it more user friendly,” Rodrigue said. This expansion project, known as Stage IV, was first planned prior to Hurricane Katrina, but shelved amid uncertainty of the future of the city, Rodrigue said. The same clients that officials had to beg not to cancel bookings after Katrina, they now have to struggle to find room in the busy schedule for, so the convention center began its current work on Stage IV about two and a half years ago. 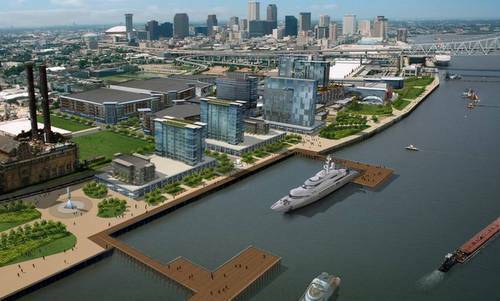 Other possibilities for the development plan include a Mardi Gras museum or even a mega-yacht harbor, Rodrigue said. The entire project, Rodrigue said, will make the Mississippi River a more accessible amenity for both tourists and locals alike. Wednesday morning’s meeting included time for only a brief question-and-answer session, but one resident praised the Lower Garden District plan: Lisa Suarez, a past president of the Faubourg Marigny Improvement Association. “I love it all the more because it takes the pressure off of us,” Suarez said. City Councilwoman LaToya Cantrell said in a recent interview that she has been urging the Convention Center officials to begin meeting with nearby neighborhood groups, to get residents’ input into the shape and scope of the project. She has also begun sharing the information with these groups herself in recent weeks, she said, such as the nearby Coliseum Square Association. None of this will happen in our lifetime; never mind the pretty little pictures. Planners know that wishing hard costs nothing. A harbor which allowed boats other than yachts and rented slips, would be absolutely amazing. Add a fishing pier and get bass pro shop to move into the area and I could die a happy man. And while cities with the new stadiums get the Superbowl, cities with the newest convention centers will get the largest and most prestigeous meetings. We can’t just sit around and wait for our demise….. It’s a good project. 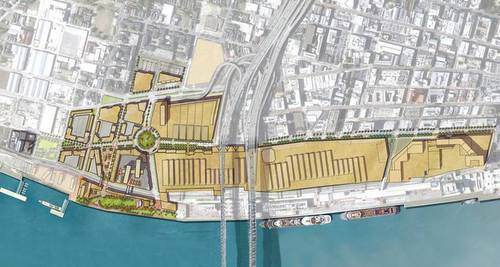 I don’t think it’s necessarily a bad idea to expand the convention center. There’s room to do so now and the numbers may well show sufficient demand for expanded facilities. However, the actual content of these plans leaves much to be desired. A people mover? That’s stupid. The Riverfront Streetcar was primarily constructed to service the convention center and it would be silly to make it redundant with a technology associated with Detroit and failure. Eliminate parts of Convention Center Boulevard? That’s extreme. It’s a major, necessary thoroughfare. We can work on improving the convention center without sacrificing mobility. A dock for yachts? Please. Not as a part of a project funded in part at taxpayer expense. These plans don’t make me happy. They could be reworked, but right now I’m far from impressed. It sounds like planners having flights of fancy. Owen, perhaps you are right on some points of your argument. I have not read the small print on the whole proposal like you have, But, as a woman, I’m going with my gut feeling. As a small business woman whose whole life depends on the convention and meetings industry, I can tell you that stagnation is death. We continue to grow, or die. Yes, we may never see this project in our lifetimes. But we have to have hope for the future. That’s more or less the slogan Perez’s shady PR group pushed in lobbying for the Holy Cross development. Fearmongering is what it is. I oppose removing traffic lanes from a major thoroughfare to construct a linear park for the benefit of conventioneers. It’s not good for the citizens of New Orleans. Benefitting conventioneers is what pays the bills. As a property owner in this area, I think this is a great idea. More high profile conventions held here = more money for the city, and increasing properties values in the area as a result of these improvements = more money for the city via property taxes. A major thoroughfare for the benefit of conventioneers? Its Convention Center Blvd which only gets backed up during conventions. Having a people mover should help out with that. Conventioneers don’t pay all the bills in this city, and most citizens see little direct benefit from conventions. However, all citizens benefit from having open streets and good mobility. Moreover, I simply don’t think we *need* to gut Convention Center Boulevard to draw in conventions. If the Convention Center offers good facilities and space to accommodate major conventions, it will be competitive. I need no reason to sacrifice our public streets.